It was the cover that caught my eye – once again proof that a great piece of cover art will attract a reader scrolling through the Kindle listings before anything like an author name or back-cover blurb. As I went through the Horror recommendations on Amazon, I saw a dream-like, ethereal drawing, a simultaneously engaging and unsettling watercolour. It posed questions I couldn’t answer but felt the need to – why did this house have what appeared to have insectile legs underneath it? It was unnatural, disturbing, and frankly a superb piece of artistry from artist Tyler Jenkins. An intriguing title – Husk – drew me in further, as did a cover quote from no less a personage than Brian Keene. 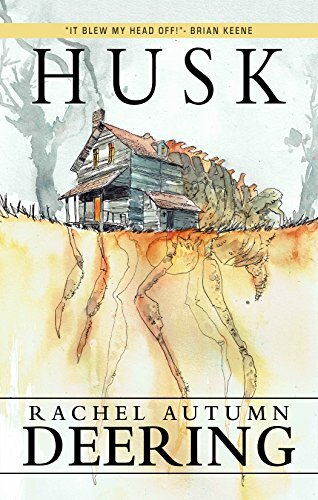 The best bit about Husk, however, was that the author is Rachel Autumn Deering. I discovered Deering when reading through several anthologies from Crystal Lake Publishing – the excellent Lost Highways and the superb Welcome To The Show. In both collections I felt that Deering’s short stories stood out as powerful, imaginative and downright horrifying works, and some of the best stories to be found in both anthologies – hardly an easy task when you consider that both books contained tales from many of the best in the Horror genre, and therefore all the more impressive. In fact, I consider Deering’s short story A Tongue Like Fire, to be found within the pages of Welcome To The Show, to be one of the finest pieces of short-form horror fiction I’ve ever read. It’s a raw, tense and heartbreaking look at the nature of grief and loss, with an ending that still haunts my memories some six months after I finished reading the anthology, and deserves to be counted among the best horror fiction published in 2018 – if not many other years as well. Given all of that, when I discovered that this disturbingly ethereal cover art of a house that was apparently turning into something insectile, was a novella written by Deering and blurbed by Brian Keene, I was deeply intrigued. Given the quality of her short stories, what would a longer-length piece of fiction look like? The cover hooked me, and the back-cover blurb only strengthened the novella’s grip on me – it spoke of a soldier returning home after years of war overseas, and having to deal with PTSD, addiction, loneliness and all the other potent issues that come with seeing war and bloodshed. And as if dealing with these very human emotions and problems wasn’t enough, he attracts the attention of something inhuman as well. Those aren’t exactly simple topics to tackle in any genre, let alone the Horror genre, which has always been at its best when looking at social issues and commenting on the nature of humanity, but I was confident that Deering would handle them in a sensitive, compelling and above-all engaging manner that would produce a high-quality piece of horror fiction. So I immediately downloaded Husk and got to reading. The opening lines immediately grip you, a shockingly casual and matter-of-fact discussion of the different ways in which one can experience blood; the disparity between the minute amounts experienced as a child, a civilian, and the terrifying amounts that can be the product of serving in the military in a hostile environment. It’s a hell of a way to open a story, and there’s a mildly nauseating ring of authenticity in the way Deering describes the ‘levels’ of exposure to blood, especially as it’s then followed by the neat juxtaposition of dispassionately describing protagonist Kevin’s duties in Afghanistan, and the lead-up to the moment his face and body become smeared with gore from the remains of a close friend. The ambush in an isolated region of Afghanistan is well-written, the rote and mundane nature of Kevin’s duties – battlefield repair and salvage – meaning the sudden assault and subsequent death is all the more jarring and memorable as a result. It also sets up the rest of the novella, Kevin eventually returning home and having to deal with both the loss of his closest and dearest friend, and also the slew of issues that came with that loss – the guilt, the pills, the therapy, and the paperwork of the Veterans Affairs agency that tries to help him. It’s rather interesting to note that even a small town like Ash Hill, Kentucky has a VA office, military bureacracy sited next to the barber shop as if it’s just a normal part of the scenery, and not in fact an indication of the distant, grinding conflicts the United States has become entangled with in the past decade and change. I’m from the UK and I’ve never served in the military so it’s all very much an alien institution to me; and regardkess of whether the author mesnt it that way, certainly to me it’s weird and unsettling to read about such a seamless integration. Deering delivers a convincing and deeply insightful portrayal of a physically, emotionally and mentally damaged individual coming back from war; the need to try and ensure he doesn’t look like he’s been crying at his friend’s grave, or how a conversation could turn in a fraction of a second from innocent to blood-soaked delusion and then back again as Kevin struggles with the symptoms of PTSD. It’s all written with a degree of care and sympathy, not always a given when PTSD is utilised in the Horror genre, and once again feels authentic, at least to this civilian; there’s no invoking of the usual cliches, of waking up from sweat-drenched dreams or alcohol-dependency. Instead Deering opts for a far more subtle and insidious depiction that slowly ramps up the tension in the novella even before we get to the explicitly inhuman element. Actually, to be more accurate that should be inhuman elements, plural, because Kevin also has to cope with the inhuman, unthinking, uncaring nature of the VA administration and how it works – an organisation all the more horrifying in its actions because it’s purported purpose is to care for men and women like Kevin who sacrifice so much for their country by serving overseas. This is an agency that can issue painkillers and other prescription drugs to allow Kevin to try and adapt back to civilian life; but then withhold his benefits due to an alleged dependency on those very drugs. It’s a Byzantine bureaucracy that is ripe for further exploitation in the Horror genre, and Deering does an excellent job here in showcasing the chilling effects it can have on veterans and others in their lives. The anger and frustration it causes in Kevin is entirely believable, and indeed is the key to Deering’s deft and engaging characterisation, humanizing the returning soldier and making him a sympathetic protagonist for the reader. The shattering effects of modern war, and the horrors of a supposedly-caring bureacracy are one theme in Husk; another, interestingly enough, is Halloween. The holiday is the setting for numerous pieces of horror fiction, short and long, good and bad, but I’m struggling to think of many that actually use the holiday *itself* as a theme within the narrative. Here, Deering uses it to explore the notions of family, home and belonging – abandoned by his junkie birth mother and raised by his grandparents, the Halloween period becomes a totem to Kevin for the ideal life; it’s not about horror or being scared, but rather a special period where he can bond with his grandparents and friends and finally feel loved. It encompasses the entire novella, from the first pages to the last, and it’s a powerful and emotionally-resonant theme that Deering deftly utilises to great effect; in fact, it’s a subtle usage that really takes several read-throughs to understand fully, and to me is just one of several ways in the book that Deering marks herself out as a truly great author in the Horror genre. Another is the great ear for dialogue she has, the way it flows naturally and sounds entirely genuine while using the regional dialect without coming across as forced or patronising. It’s not something that I’ve noticed many authors taking the effort to understand and use, to the extent that most protagonists come across as entirely bland or cookie-cutter, and the fact that Deering not only attempts it but actually succeeds, is another reason Husk is such a memorable read. Powerful themes and imaginative and original angles on familiar topics are allied with Deering’s usual high-quality writing, in particular her excellent use of descriptive language. Husk is a delight to read and become enmeshed in, engaging with you in a way that I rarely find in any genre; it rewards repeated readings with fresh insights and observations, integral themes becoming more obvious and interconnected. In particular I’d like to focus on how the author describes the house seen on that memorable cover, inherited from Kevin’s grandparents after their deaths; Deering’s descriptions of the building succeed in bringing it to life, creating a place that is not only integral to the plot but very much a character in its own right, one that comes to dominate much of the latter-half of the novella in a variety of disturbing ways. Deering also creates a compelling atmosphere dominated by suspicion, paranoia and the protagonist’s declining mental state, and fuelled by what he finds within the house itself and the situation he becomes embroiled in despite his best efforts. The most memorable aspect of this atmosphere is the weather, and the quiet skill Deering showcases in utilising it to reflect Kevin’s mood and psyche. Although it’s a much-abused cliche, once again Deering demonstrates her clear skill as a horror writer by making it both integral to the narrative without turning to stereotypes, and also undeniably disquieting as a harbinger of the horrors to come. The narrative itself is well-paced and, as mentioned previously, highly engaging. Kevin is obviously a deeply damaged individual even before he inherits the house, and then he’s thrown even further by the arrival of an attractive new neighbour who seems interested in him; and, much more ominously, a weird, inhuman creature that stalks the house and surrounding area, watching through windows. Not to mention an on-going battle – not just with the strange creature, but with the inside of his his head and the memories and traumas within it that can be triggered by something as innocuous as an overzealous preacher in the local church. There’s a huge amount of subtext to be found in Husk, ideas and themes and metaphors that require those multiple re-reads to unpack, and at times it feels like several horror novellas all packed into one title. But it never becomes dense or unmanageable, the plot flowing smoothly and evenly under Deering’s nuanced direction. I must admit that my favourite horror stories are those where you can’t truly tell fiction from reality in the narrative being woven, and Husk has that in spades. Even as the novella reaches its climax, there’s an undercurrent of doubt that Deering cleverly inserts, making the reader question what Kevin is witnessing; whether the monster haunting him is real, and indeed whether anything he’s involved in is what it seems, are questions that don’t have a satisfactory answer. A great deal of Husk is bathed on ambiguity, and I appreciated that – Deering trusts the reader enough to let them make up their own mind rather than spoon-feeding something concrete. But it isn’t just atmosphere, ambiguity and paranoia to be found inside the pages of Husk – there’s violence as well, and gore; and when it comes it’s sudden, bloody and completely unexpected, especially in the detailed, stomach-churning brutality that Deering suddenly unleashes after lulling the reader into a false sense of security with several chapters of slow-paced, atmospheric horror. Husk is a visceral, insidious, compelling, and above-all superbly-crafted piece of Horror fiction by an author who is on the well on the way to becoming one of the most accomplished in the current generation of Horror writers. It is a fantastic demonstration of Deering’s skills as a writer, moving deftly from quiet horror to body horror, with a real gut-punch of an ending that leaves the reader both horrified and disquieted. It is also, to paraphrase Sir Winston Churchill, it is a riddle wrapped in a mystery inside an enigma. I have read it through three times now, and am still finding things to pick out – themes, clues, ideas – that Deering has cleverly implanted through her writing, and every time I’ve finished I’ve come up with a different theory as to what happened. Frankly, this is a must-read for any fan of the Horror genre, and I can only hope that Deering builds on this excellent beginning to write more long-form fiction. Should she pen another novella, or even a full-length novel, I would be the first to pick it up – and undoubtedly not the only one.